A catastrophic failure in science is said to occur when a long-established theory that has been embraced by learned advocates is discovered to be at odds with the part of the world it is supposed to explain. In other words, when a view of the world maintained by conventional wisdom is contradicted by the facts of life, polite society is due for a shock of disappointment or worse. It is especially catastrophic if the unmasking occurs long past the point where it is obvious that the predictions of the theory diverge wildly from dependable and repeated observations of indisputably identical quantities. A historical example of such a catastrophe comes from the annals of physics. This experience led to the characterization of such a phenomenon as a catastrophic failure of a scientific theory. The Deliberate Corrupt... Tim Ball Check Amazon for Pricing. 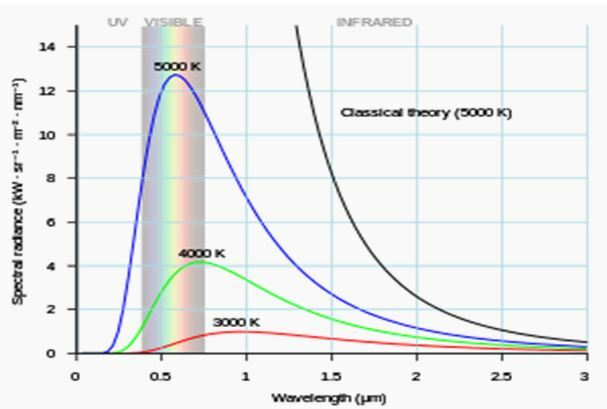 The term “ultraviolet catastrophe” was first used in 1911 by Paul Ehrenfest to refer to the gross exaggeration of the radiative power of black bodies by the Rayleigh–Jeans law of blackbody radiation, the conventional wisdom of the time. However, the demise of this theory actually occurred years before 1900 as physicists acquired better instrumentation for measuring the radiative power of black bodies at various temperatures and specific wavelengths and began to recognize the discrepancy. The Rayleigh–Jeans law, named for two of the most respected physicists of the 19th Century, was considered “settled science,” a now hackneyed phrase. And in all due respect, it was the first brave attempt to characterize an important phenomenon mathematically, which it did merely by fitting the few measurements available with an exponential function of wavelength. That its failure to comport with reality was a “catastrophe” was due its sudden but long overdue rejection by physicists in favor of a new “law.” The error, which came to be seen by physicists as outrageous and absurd, appears as the vertical difference between the blue and black lines in the following chart. That Rayleigh-Jeans was an “ultraviolet” catastrophe refers to the fact that its predictions deviated wildly from the values derived directly from careful observations, especially those in the short wavelength region of the The Little Green Book ... James Delingpole Best Price: $5.00 Buy New $6.08 (as of 08:15 EDT - Details) electromagnetic spectrum that is known as the ultraviolet region. Ehrenfest and others were shocked to see the extreme error in the magnitude of the spectral radiance (radiant power at a given wavelength) predicted by Rayleigh-Jeans, depicted here as the “classical theory,” especially at wavelengths less than 2.0 μm. Although the error was confirmed by comparing the predictions of the classical theory with discrete physical measurements of the same quantities, its extent and magnitude along with the inadequacy of the science in this area was not fully recognized until Max Planck developed his now famous blackbody radiation law, first disclosed in 1900. Planck was appointed an associate professorship in theoretical physics at the University of Kiel in 1885 where he engaged in research on entropy and its treatment, in physical chemistry. He published his Treatise on Thermodynamics in 1897. But his search for an explanation of the electromagnetic emission phenomena came about as a result of a retainer by the German electric industry to help them perfect Edison’s incandescent light bulb. The search for an explanation had been on since Kirchhoff defined the phenomenon in 1859. The ultraviolet catastrophe of Rayleigh-Jeans coupled with Edison’s invention only made the search more urgent. But physics got more from Planck than it bargained for. His achievement of a general theory of radiant emission by blackbodies did not take place before he revolutionized physics with his highly controversial quantum theory. Now about a century after the ultraviolet catastrophe, a similarly catastrophic theoretical situation has brewed in the scientific community. 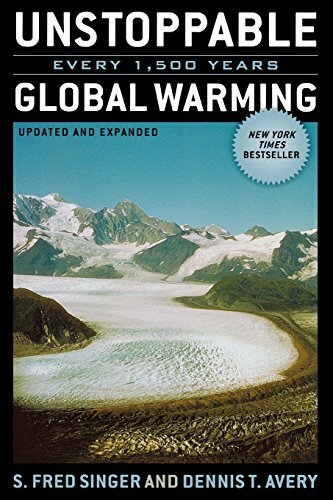 I refer to the popular anthropogenic global warming (AGW) theory that predicts that the human emissions of carbon dioxide from fossil fuel burning will cause global temperatures to run wild and eventually melt the polar ice caps, flooding coastal populations, acidifying the oceans, killing marine life and turning the fertile Earth into a desert. One could ask how such a radical theory could prevail in view of the fact that it so obviously fails to conform to reality, as can be seen in a simple graph of the year-to-year change in mean surface temperature of the Earth. 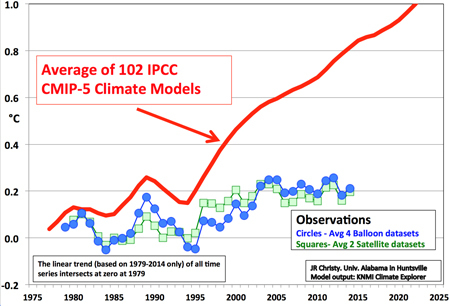 An example is the following chart prepared by climatologist John Christy of the University of Alabama. Christy himself presented these results to the U.S. House of Representatives Committee on Natural Resources on May 15, 2015. Despite his revelation that the theory upon which congress was relying for its Draconian carbon control legislation had crashed and burned, no reaction was reported. Could this be evidence of denial? 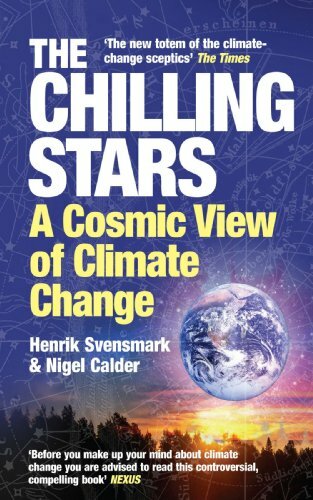 The Chilling Stars: A ... Henrik Svensmark Best Price: $3.25 Buy New $12.25 (as of 09:00 EDT - Details) Compounding the predictive error is the fact that the magnitudes of the temperatures under study vary year-to-year by an amount less than the error band of the temperature measurements (± 0.2˚C). This means that the temperature changes measured or computed are unreliable, uncertain and possibly insignificant. Furthermore, the government’s climate modelers have been caught red-handed “correcting” historical temperature measurements downward to exaggerate the heating trend. Even so, the computed temperatures for the past 20 years overstate the actual ones by only 0.4˚C, so what’s the beef? Although there may have been a slight warming of the Earth over the past several decades, this may have been nothing more than the Earth’s continuing recovery from the Little Ice Age, which can hardly be blamed on human industry. Perhaps most discrediting to the AGW theory, however, is the history of atmospheric CO2 concentration, presented for the past sixty years in the following chart. This chart shows that during the same 40-year period covered by Christy, the atmospheric CO2 increased by a whopping 40%. Meanwhile, the mean surface temperature of the Earth changed by less than 0.4˚C. Where’s the correlation? 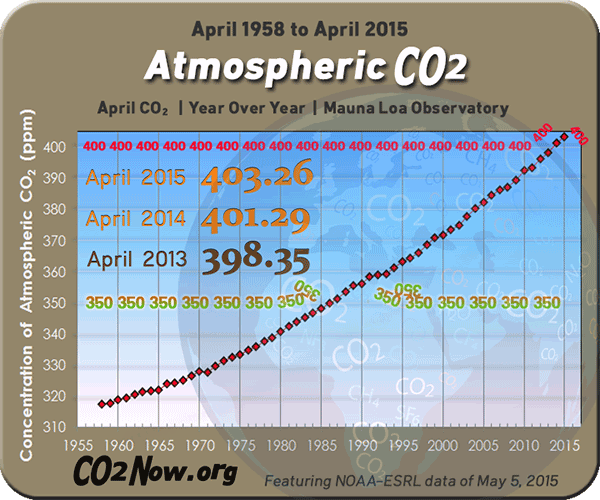 Regardless, 400 ppm CO2 is only 0.04 % of the atmosphere. This compares with a water vapor concentration (humidity) of over 2.0 %. Moreover, water vapor is a much more powerful greenhouse gas than CO2, and its presences there cannot be blamed on human industry. This finding not only falsifies the theory that anthropogenic CO2 causes the Earth to warm irreversibly, it also denies that there is even a correlation between the theory and the observations. 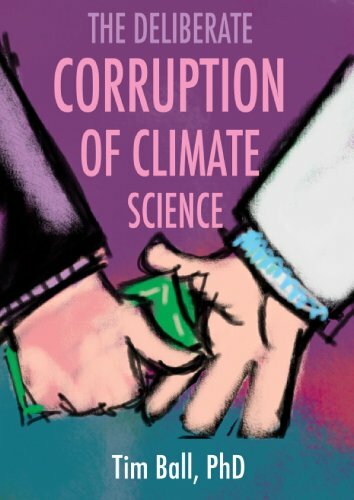 In spite of the outrageous disagreement between the government’s expert’s computer simulations of the Earth’s climate and predictions of its surface temperature distribution and the peer-reviewed measurements collected by Prof. Christy, the government in collaboration with the mainstream media continue to broadcast pseudo-scientific Earth-warming propaganda. As this propaganda is regularly reduced to absurdity by such skeptical scientists as John Christy, the catastrophic failure of the AGW theory will gain wider recognition. 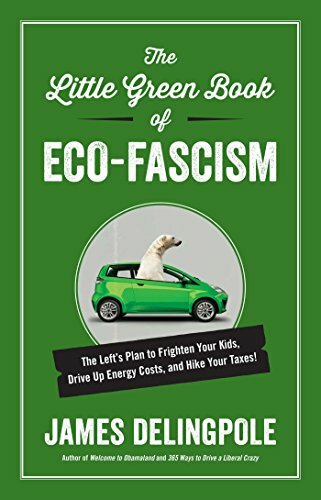 One can only hope that this catastrophe will be recognized in time for the public to prevent the government from blundering into an actual economic catastrophe brought on by economically destructive regulation and taxation of the private use of fossil fuels mistaken as the cause of adverse climate change.